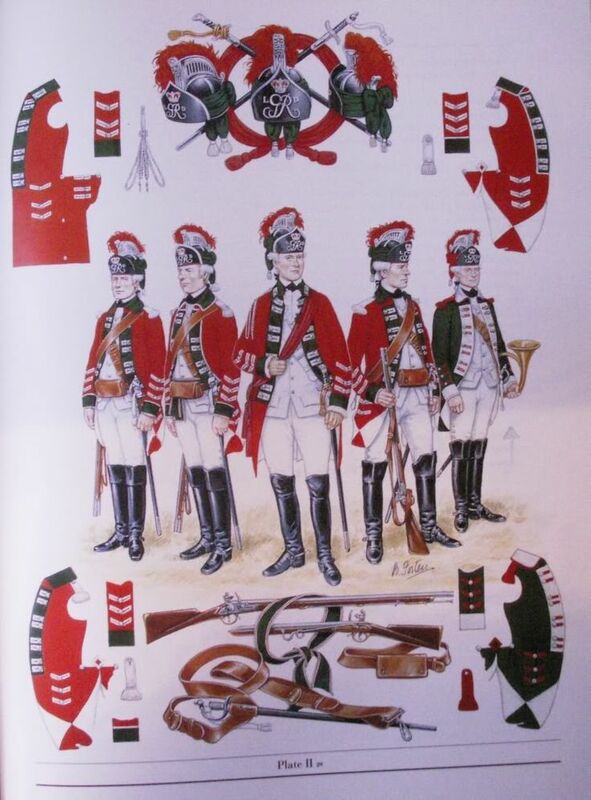 I've long been tracking down details of the 15th Light Dragoons' uniform, to paint figures for my own collection. Here's what I've found so far. David Morier painted a depiction of two troopers and a hornist of the 15th Light Dragoons. It was included in David Blackmore's "British Cavalry in the Mid-18th Century", from Partizan Press, 2008. The illustration includes an attribution, "Reproduced by kind permission of the Earl of Pembroke and the Trustees of the Wilton Estate". The troopers wear the red coat with dark green lapels, cuffs, and collar, and white turnbacks, double white lace for the button holes, in pairs, white waistcoat and breeches, white epaulettes with fringes. Silver buttons. No lace or buttons on the collar. Three chevrons of doubled white lace, pointing downwards, on the sleeves above the cuffs, and on the coat tails below the pockets, so that they were then visible between the turnbacks. There is what appears to be a hollow diamond of lace at the lower seam at the back of the coat, where the left and right tails are joined. Black neck stock. Black jockey cap with enameled turned-up front plate, silver crest with red plume and dark green turban. Buff carbine belt over the left shoulder, buff waist belt supporting a buff cartridge pouch worn at the front. The hornist wears the dark green coat with white lapels, cuffs and collar, no lace on the lapels, but what appears to be a single red lace on each side of the collar, three white chevrons of lace, pointed downwards, on the sleeves above the collar. Red epaulettes with fringes. The hornist wears the same cap as the troopers. There is a further image here: http://www.britishempire.co.uk/forces/armyuniforms/britishcavalry/15thltdragoons1763.htm that is apparently from another Morier painting. It depicts an ordinary trooper and supports the description of the uniform details. And a further source I've found is in "Uniforms of the Seven Years War 1756-63" by Malcolm McGregor and John Mollo (1977, Blanford Press-Poole, Dorset). Their illustrations 152 and 153 depict a hornist and a private, respectively. McGregor's depictions generally match the others that I've described; he, too, shows the hornist with red buttonhole lace on his lapels. He also shows the hornist with red epaulettes but with white fringes. For the drummers, I've found a postcard with an illustration credited to Alix Baker, entitled, "AB8/1 Drummer, 15th Light Dragoons (or Eliott's Light Horse), 1760". The card is marked, "Published by Alix Baker, Hortus House, Old Coach Road, Bulford, Salisbury, Wiltshire SP4 9DA" The illustration shows the drummer wearing a green coat, heavily laced, with no lapels, a red collar and white turnbacks. The edges of the coat front and the collar have a white lace edging. The sleeves have pointed cuffs in red, with five chevrons, pointing up, consisting of bands of white lace with red lace in the center. The coat has swallow's nests, red with white lace, white epaulettes with fringes and a border of red lace or piping. On each side of the front of the coat, there are two vertical bands of the same white-red-white lace, from the shoulder seams to the hem of the coat tails. Between the inner band of lace and the edge of the coat, there are seven horizontal bands of the same white-red-white lace. The illustration does not show the back of the coat, so it's not clear whether these bands of lace are repeated on the back. There is no mention of any source for the details of this depiction. However, in the Mollo/McGregor book, Mollo mentions that the drummers had hanging sleeves. Maybe we can use these images, if we can get clearances (as necessary). I forgot to mention that in his "British Army Uniforms from 1751 to 1783," Franklin has a plate depicting the 15th LD's uniforms, too. However, he has no specific info about the musicians' coats. Schirmer also describes the uniforms, including the musicians, and generally matches the descriptions I listed above. He specifically describes hanging sleeves on the drummers' coats. This page was last modified on 6 November 2017, at 18:29.